The Poddar Haveli in Nawalgarh town has been converted into a museum. Many of India's industrial houses like the Birlas, Poddars, Bajajs, Mittals, Khaitans, Goenkas, Ruias, Parasrampurias and Kanodias, are from the Shekhawati region. In the old days Rajasthan was on the trade routes to Central Asia, Delhi-UP, Gujarat, Africa, and West Asia, and it was very rich. That wealth is reflected in the havelis. The Rajput houses were built with local sandstone, but the merchant havelis also incorporated lakhauri bricks, plastered with a special mortar prepared from lime, jaggery, guargum, urad dal, jute fibre, and bilva pulp. The havelis incorporate outward projecting balconies, brackets, arches, chabootras and intricately carved wooden doors. The masons who built these beautiful structures are known as khatis, while the gorgeous frescoes were the work of chejaras. 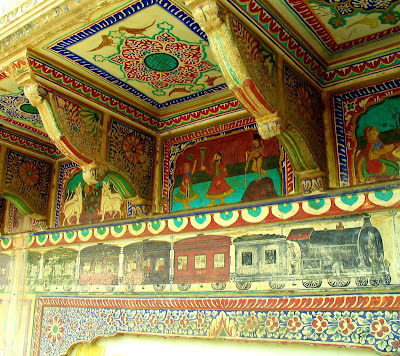 Each haveli is built in different style, with gorgeous frescoes decorating the inner walls and roofs. Some from the 19th and 20th centuries incorporate European design features. By those days the old trade routes had dwindled away, and the economic powerhouses were the British stations of Bombay, Madras, and Calcutta. The construction of the railway was the last blow to the Rajasthani trade economy. Many of the merchant families migrated to greener pastures, leaving so many havelis to years of neglect. 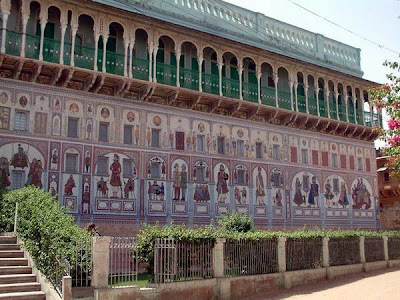 Now some of these have their architectural structure being restored, with the help of the traditional khati masons and chejara painters, while the interior designs inculcate modern amenities for foreign and domestic tourists.